This is the sort of novel I really love. All Our Yesterdays is the story of a group of friends and lovers. It follows them through their days at U.C. Berkeley up until the present. None of them can manage to leave the Berkeley orbit for long, and the bulk of the story takes place in Berkeley and the greater San Francisco Bay Area. Zeke is the protagonist. His childhood friend from the Los Angeles area is Stan. Zeke falls in love with Molly, a young woman from the rural Midwest, his sophomore year at Berkeley and eventually marries her years later after much water has flowed under the bridge. Liam is the writer who eventually marries Melanie, a high school friend of Zeke’s. Corin is the radical activist bad guy who is responsible for most of (if not all) the Sturm und Drang in the book. Tarloff uses an interesting convention. He alternates between the time period of 1968 through 2003 and what he calls “Now ” in the chapter headings. The earlier period is narrated in the first person from Zeke’s perspective while the Now chapters are narrated by that omniscient third person narrator. All Our Yesterdays is an enjoyable, engaging novel. When I was in college in the early 1970s writing a term paper was a major undertaking. I would check the books out of the library I needed for my research and make notes on 4×6 cards. I would then arrange the cards in an order that had some kind of flow to it, put a piece of paper in my manual typewriter, and start typing. Footnotes were torturous, especially when I chose to put them at the bottom of the page rather than at the end of the paper. Doing the bibliography was tedious, as I worked to ensure that each entry conformed to the proper Chicago Manual of Style format, as presented in the term paper bible of the day, A Manual for Writers by Kate L. Turabian, generally referred to simply as Turabian. I don’t know what methodology is used by today’s college student, but it certainly involves the use of their laptop, and there must obviously be at some amount of copy and paste, a luxury I didn’t have. You’re aware that I have a serious case of nostalgia for the 1970s. That is absolutely the case, and I loved my days at Pitzer College. Nonetheless, spell check technology would have saved me a good deal of pain and grief back then. Terry’s cholesterol numbers recently came back a tad higher than she or her doctor would have liked, so I planned a number of vegetarian dinners for last week. One of those was a potato, lentil, and spinach stew I found in the vegetarian section of my Living Cookbook database. The Source field carefully cited the cookbook it came from: Williams-Sonoma Food Made Fast: Vegetarian. I’ve never owned or used that cookbook, so I assume I originally got the recipe online, probably from the Yahoo! vegetarian group back when I was a member. But here’s the thing. The recipe called for the lentils to be cooked in advance. Now, really, isn’t that cheating? I mean who cooks lentils in advance? And without the lentils cooked in advance, it really isn’t a fast meal. I thought about cooking the potatoes and lentils separately in two sauce pans, but that seemed like more work than necessary, and why use a second pan that will need to be washed? The other piece here is that I threw in a carrot, since the recipe as written seemed a bit spare, and that would require some cooking time. My solution? Use the pressure cooker. I peeled and sliced the potato and carrot and threw all the ingredients into the pressure cooker along with the spices the recipe called for: cumin, coriander, and garam masala. I added sufficient water to bring the cooker up to pressure. It came out quite well, and Terry was pleased. I was happy about that. But I still scratch my head at the cheating involved to force that recipe into the “fast” mold. There was a big dust-up which reared its ugly head on my Facebook news feed a week ago Saturday. A well-known (in certain circles) author of books on the history and future of Christianity made a comment complaining about the new design of a popular Episcopal news and features Web site. That created a firestorm of comments and some justifiably hurt feelings. The original poster then, somewhat immaturely in my mind, said that she was never, ever going to post anything at all about the Episcopal Church on Facebook again. On that very same Saturday I had an email from my spiritual director confirming our appointment for the next Monday. She also said, in response to a question on my part, that she wasn’t spending a lot of time on Facebook these days. I thought it was a good time to follow suit. I unfollowed a number popular religious figures in various denominations who were appearing regularly on my news feed. I unfollowed a number pages as well. I have not unfollowed family or friends from high school, college, and work. Nor have I unfollowed those blog friends with whom I have developed a rapport. So if you are a friend on Facebook and are reading this blog entry, you are almost certainly still showing up in my news feed. The whole thing made me think about how Facebook, unchecked, can be quite the time sink. And given that it is rife with inaccurate information, out-of-date news, anger, bias, and sometimes simply frivolous content, scaling back was a good thing. Transforming my news feed into a way of keeping up with friends and family, along with a few Episcopal resources and the NPR Books page, while paring away the rest has been a liberating, freeing experience. 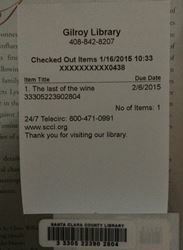 I am very much aware that my county library system is truly with it when it comes to technology. You know that I’ve been checking out eBooks ever since I first got my library card. I have long known that I can log on to the library’s Web site and access a whole array of reference resources including the Oxford English Dictionary and Encyclopedia Britannica. Until last week, however, I had not experienced the checkout process for a physical item, when I actually went into the library and did so. Terry had described it to me, but it was a different matter to experience it myself. It’s all self-service with multiple stations. You lay down you books with the bar codes facing up on a mat that looks something like an oversize mouse pad. You scan the bar code on your library card, enter your pin, and use a touch screen to indicate whether you want a printed or email receipt. That’s it. You’re on your way. Quite a difference from when I was a youngster checking out books from my local public library.